Mr. Jamie Gillespie and Mr. Tashi Phuntsho from APNIC(Asia Pacific Network Information Center) are currently conducting a week long workshop on Information and Network Security Workshop from 9th- 13th October, 2017. The workshop will be covering topics on Network and Security threats and breaches, Policies and Counter measures. It is a platform to bring together important stakeholders from critical sectors and foster information sharing among them. 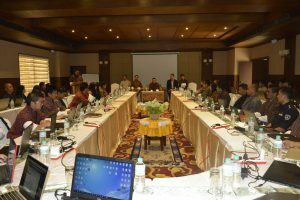 Participants include ICT personnel from Banks, Power Corporation, Royal Bhutan Police,RUB Colleges, Dzongkhags and Ministries. The workshop is funded by EU(European Union) and TEIN*CC @TEIN (Trans-Eurasia Information Network* Corporation Center) through the Asi@Connect Project and organised by BtCIRT (Bhutan Computer Incident Response Team) ,Department of Information Technology and Telecom.